Carefully selected network partners throughout Europe made us a leading provider of road transport. Individual planning and handling by very flexible dispatch management guarantees you best results for LTL/ part load, FTL, high and heavy and hazardous materials transports. A modern truck fleet combined with highly qualified operational staff is the perfect foundation for a local, domestic or international road service. Language is our advantage – most of our employees are native speakers of the served countries. You can rely on over 45 years of experience in house to house shipments, part and or full loads no matter of in time or express service. If you are looking for qualified pick and pack partner or a warehousing solution, call us. 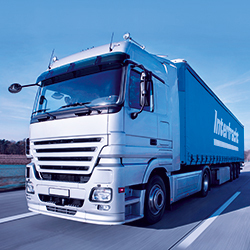 Interfracht organizes your FTL or LTL within Germany or throughout Europe regardless or your shipping location. We perfectly serve the medium sized customer. Especially here we can offer highest quality standards, on time delivery and excellent communication. Individual handling, high flexibility and just in time service. Exceptional loads with out of gauge dims or weights. Servicing the supply chain from origin to final delivery. Consulting for crating and documentation.